What the * do we mean by non-traditional talent? HomeWhat the * do we mean by non-traditional talent? We’re all about finding, skilling up & empowering non-traditional talent for regional jobs in technology. Our regional economy could really use a more vibrant, expert, and inclusive talent pipeline. It’s a comprehensive thing: a shift in mindset about who can work in technology, and how we spot and train talent in practical ways. Q. So what do we mean by non-traditional? A. Anyone without a computer science degree, who wishes to work in a role traditionally open only to people with a computer science degree. Sometimes entirely self-taught coders – people with backgrounds in music, languages, logistics, art, etc. – get into a workplace and code rings around credentialed computer scientists. Many people who have the aptitude and motivation to become computer scientists are discouraged by the economic and cultural barriers on the path to a cs credential. Computer science degree programs are very frequently grounded in outdated skills and approaches. A diverse team of problem solvers will out-perform a homogenous team every time. The sector needs diversity. Our affordable coding classes are designed to bridge a critical gap for empowering non-traditional talent. Students can gain an overall understanding of the economic value of hard skills, find out where they fit it, as well as develop those hard skills and option to portfolio projects that expose them to employment opportunities. 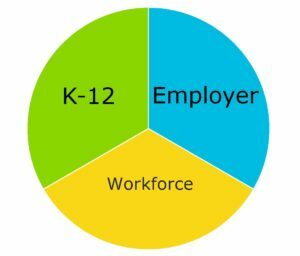 7 Cap Region employers, 23 senior K12 administrators, 1 topic: How do we nurture tech talent? They also fit into a bigger ecosystem we’re creating in the Cap Region. 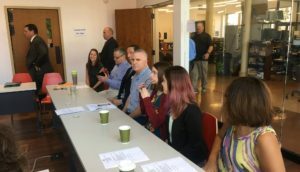 Employers can speak to K12 students and educators and support custom training courses, as well as spot emerging talent through mentoring our coding classes. And K12 districts can start empowering people from younger age, so more young people embrace rather than hide from computing. In short, we think that empowering non-traditional talent calls for a non-traditional approach.